I read about this tip in a magazine somewhere - though I can't quite remember where. It's supposed to be a time-saver for slicing strawberries. 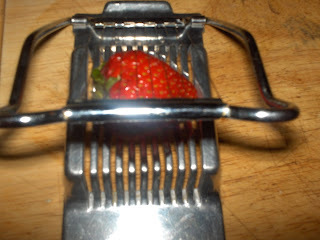 Take a regular egg slicer, place a strawberry inside and press down. I have to say it worked pretty well. 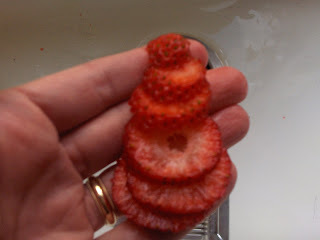 I had nice uniform strawberries for shortcake. The best part was the hull was removed without a lot of waste.